The members of the new unit that YG ENTERTAINMNET has been suggesting are found to be BOM and LEE HI. 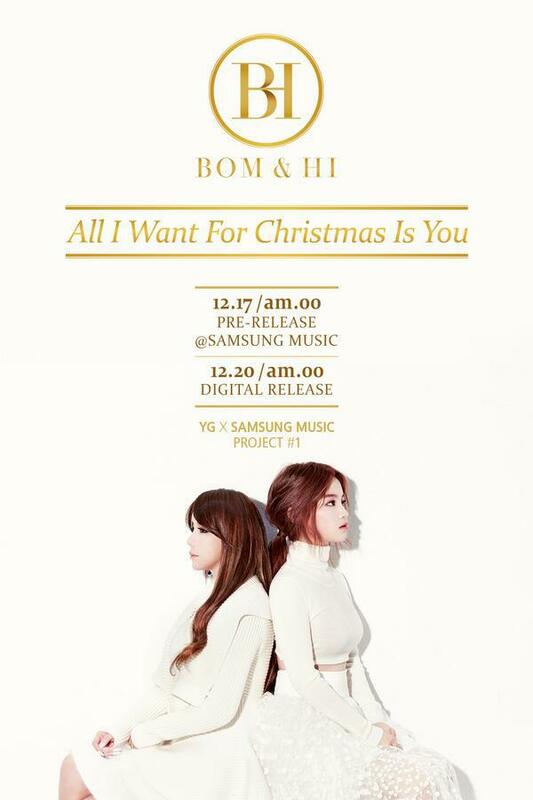 According to YG’s announcement on the 16 this month, the two have formed a unit team named “BOM & HI” and releases a song that is a reinterpretation of Mariah Carey’s “ALL I WANT FOR CHRISTMAS IS YOU”, one of the most loved Christmas season songs, at midnight on the 17. In the teaser image disclosed with the announcement, BOM and LEE HI is looking at the opposite directions back to back, in feminine white costumes. Notably, LEE HI is displaying a mysterious and matured woman’s image with her white skin and red lips, shaking off her past girly image. The video that was disclosed with the teaser image gives a unique feel, too, with the background sound of music box, as was in the first and second videos. LEE HI drew mush attention by appearing in the video in blue eyes. 2NE1’s main vocalist BOM is popular for her heavy and unique vocal and LEE HI has also been under the spotlight with her unique and appealing voice and matured talent, so a great synergy effect is expected. The new unit is formed as a collaboration project between YG ENTERTAINMENT and Samsung Music, newly opened by Samsung Electronics in Korea. The new song by the two will be exclusively released on Samsung Music for three days from the midnight on the 17 and will be disclosed on all on-line music-streaming sites from the 20.